ArabSaga: Iran proxies growl: Hands off Assad! “The best defense is a good offense” is a popular saying in sports and military combat. For Iran, the idiom might also prove useful in politics to prop up its embattled strategic ally in Damascus. Iraq’s Prime Minister Nouri al-Maliki and Lebanese Hezbollah leader Hassan Nasrallah – both Shiites and unabashed surrogates of Shiite Iran – are openly warning of regional sectarian conflict if Syria’s quasi-Shiite President Bashar al-Assad is ousted. In an interview with The Associated Press (AP) released yesterday, Maliki warned a victory for rebels in Syria would create a new extremist haven and destabilize the wider Middle East, sparking Sunni-Shiite wars in Iraq and Lebanon. The implication of his comments is that Assad’s ouster would empower Syria’s majority Sunni Muslims. "If the world does not agree to support a peaceful solution through dialogue... then I see no light at the end of the tunnel," Maliki told AP in Baghdad. The war in Syria has sharp sectarian overtones too, with predominantly Sunni rebels fighting a regime dominated by an Alawite minority, an offshoot of Shiite Islam. Nasrallah also warned yesterday against Shiite-Sunni infighting in Lebanon related to the Syria war. Nasrallah denied accusations by the Syrian opposition that his men were fighting alongside forces loyal to the Assad regime, and reiterated that some Shiites in villages along the Lebanese-Syrian border, including Hezbollah members, have taken up arms in self-defense against Sunni gunmen. (Nasrallah’s views have been publicly challenged by Hezbollah’s first Secretary-General Subhi al-Tufayli -- see my post yesterday, “The other face of Hezbollah”). Officials and analysts say there is real anxiety within Hezbollah that if Assad falls, the militant group might lose not only a crucial supply of Iranian weapons via Syria but also political clout inside Lebanon, where it currently reigns supreme. ON ONE HAND we have the Euro-American approach to the Syrian revolution, which is to starve it of serious military backing in order to keep the regime in place. Most Western military experts concur the regime could have been brought down last year had the revolutionaries been supplied with antitank and antiaircraft weapons and logistics equipment. 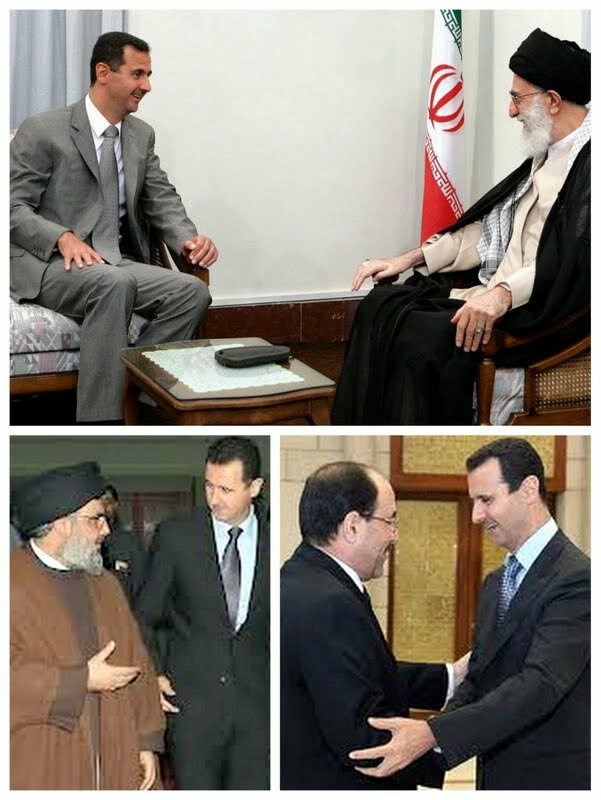 From this perspective, decision-makers in the West do not mind the fighting continuing to (1) destroy united Syria and hearten Israel (2) drain Iran financially, militarily and morally and implicate its Lebanese offshoot Hezbollah in the killing of Syrians (3) ingather as many Arab and non-Arab Jihadists on Syrian soil, where they can be easily monitored, then killed there and elsewhere. Maliki, offspring of Iran’s cherished Islamic Dawa Party, warns that a Syrian revolution victory will trigger wars in Iraq and Lebanon. Therein lies a cloaked warning to internal Lebanese and Iraqi sides that (1) they would be made to pay for Assad’s fall (2) the Shiite surge will fight tooth and nail in Lebanon and Iraq to preclude turning back the hands of time. Maliki means to say (1) Iraq’s Shiites will fight to keep the upper hand in Iraqi politics and security (2) Hezbollah won’t hold back from waging an internal war to prevent putting back the Shiite jinni in the bottle from which it emerged a few years ago. In other words, the post-Assad chapter is the subject of serious thinking between Iran’s satellites in Iraq and Lebanon.